If you’re looking to install a custom shower pan with a large, low-curb walk-in opening for Mom and Dad, the last thing you want is for them to fall once after they get into the shower. Accidents, bathrooms and older people (no, I don’t put my 58-year-old self in that category, thank you very) are too often joined at the ‘broken-hip’ (bad, analogy here, but true). This is one disaster you must avoid. A slippery shower pan – and the potential fallout from it – is NOT happening to you. As you may realize, most solid surface wall panels are glossy and slippery. Water and soap roll off for easy cleaning. While you want an easy to clean shower pan, it can’t be slippery. All solid surface shower pans (whether they are standard or custom sized) have textured bottoms. They surpass the dynamic coefficient of friction levels (this is an engineering geeky term for how slipper the base is) set by the American Nationals Standards ‘Slip Test.’ Bottom line – a solid surface base provides you, and your loved one, with solid footing whether you choose a gloss or matte finish. It’s safe for you, and it’s safe for Mom or Dad. With all that being said, the matte finish does provide surer footing than gloss. I wish solid surface shower pans were as cheap as acrylic or fiberglass. If they were I believe acrylic and fiberglass would be virtually dead – unless someone needs a lightweight base. 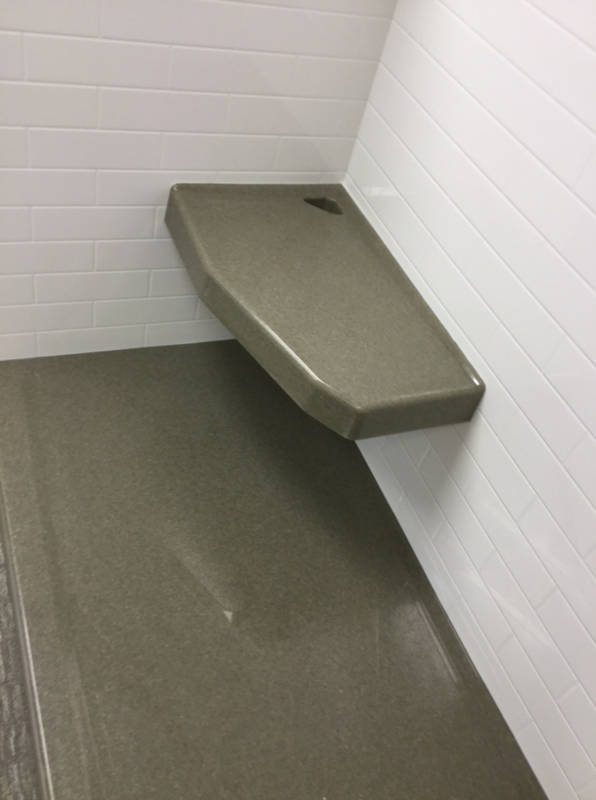 Solid surface bases are comparably priced with a custom tile pan installed by a professional contractor. With this choice you don’t have to worry – unlike mortar tile bases – of leaking shower pans and grout maintenance costs. Example 1 – A 36” x 36” custom solid surface stand-up shower enclosure with a custom drain location. Example 2 – A 43” x 43” custom solid surface NEO angle corner shower with a custom drain location. 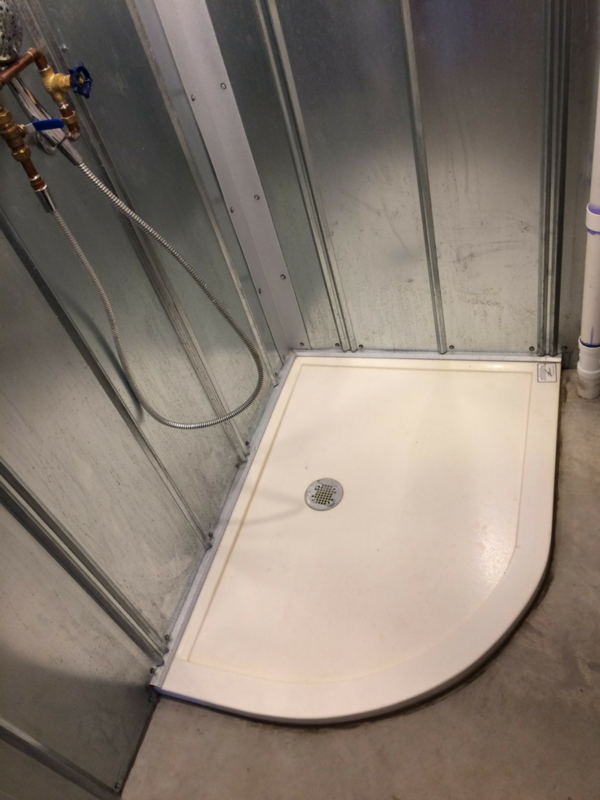 Example 3 – A 66” x 40” custom offset shower pan (this means there are 3 walls inside the shower and a partial framed wall in the front) with a custom drain location. 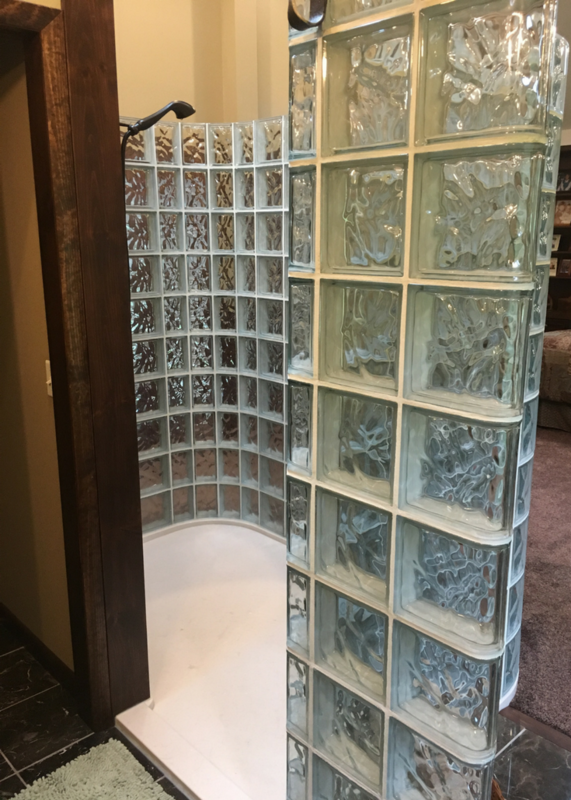 Example 4 – A custom shower pan built for a curved glass block wall in a 72” x 40” size. Yes, custom solid surface shower pans aren’t a cheap date, however, they have a lifetime guarantee, are built as sturdy as a tank, and you’ll NEVER have to replace them because they cracked and caused a leak in the floor below. If your mobility, or that of your family members, is not what it used to be (or someone has been diagnosed with ALS or Parkinson’s Disease) the curb height decision is critical for the shower to function at all (no matter what type of base you choose). 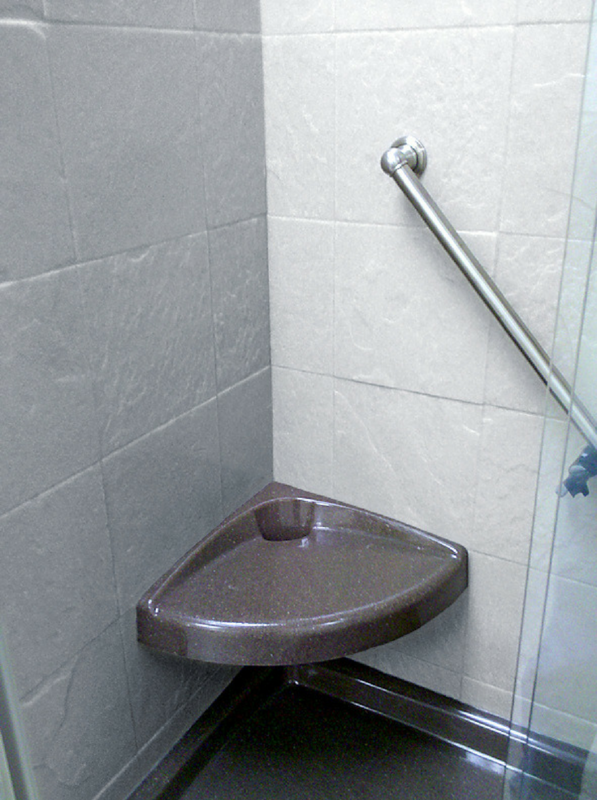 Solid surface shower pans are available in a ‘standard height curb’ (which is 4 ¼” tall), a low-profile curb (which is between 1 ½” to 2” tall) or a barrier free roll in entry. I would define the depth of the curb (or threshold as some people call it) as the width of the platform as you step into the shower. For a frameless 3/8” thick glass enclosure a curb width of 2 ½” to 3” for your custom pan will work well. However if you’re using a 3 1/8” curved glass block wall you’ll want a width bigger than the blocks (I usually recommend 4” wide). Yes, size does matters, but also so does width. This is not a variable many people think about, but, if someone in your family can’t get into the shower you may end up saying, “Houston, we have a problem (your language may be more ‘flowery’ than this).” With custom solid surface pans, you can make the opening any size you’d like. If you’re not sure how to size an opening check out 5 Proven Questions to Get the Size of Your Shower Opening Right. Sometimes with acrylic or fiberglass pans you’ll see a seat is molded into the pan. With custom solid surface pans this is not the case. Molding a seat into the pan makes it challenging (OK – near impossible if I’m being honest) to fit through the door in a bath remodel and offers limited flexibility. With solid surface pans rectangular bench seats are butted up to the end of the shower pan. If you want to maximize the size of your pan and not make the shower too crowded, then it makes sense to go with a solid surface corner seat which is mounted on the wall. Fact #5 – You can choose your drain location. Moving drains in a remodel is a pain in the drain (OK – bad humor, but I resemble that). 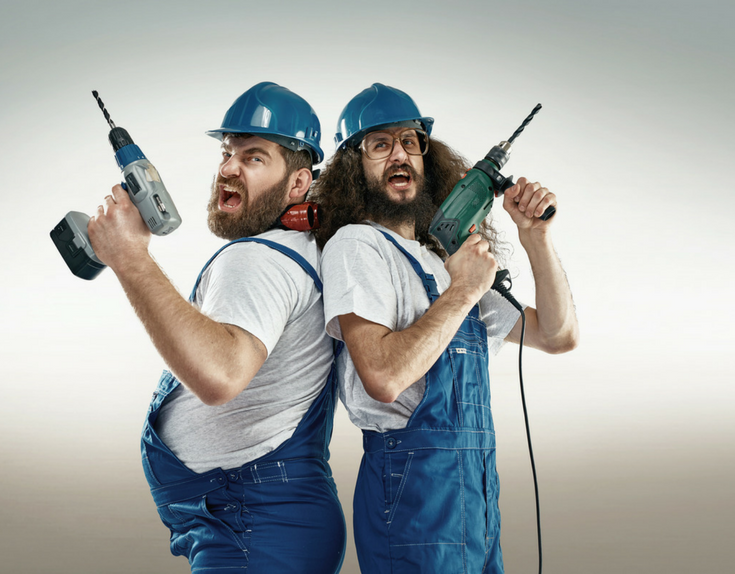 If you’ve got a concrete floor the process is dusty, time-consuming and expensive if you’re paying top-dollar to use a professional remodeling contractor (note – your ‘professional contractor’ SHOULD NOT look like the guys below). While a custom solid surface shower pan can be expensive (see fact #2) – you’ll save money because you can choose your drain location and won’t have the cost of cutting the floor and re-routing plumbing. One rule to keep in mind. Stay at least 8” off your stud walls for your drain location. The reason for this is otherwise the slope to the drain is too steep. If you’ve set an acrylic or fiberglass pan you know how messy mixing thin set mortar with a drill and paddle is. Then, you still end up feeling these bases flex and make funny creaking sounds as you walk on them. Yuck! What’s cool about solid surface is it is …. solid. Not only will you like a sturdy, non-flexible surface to walk on, but they also don’t need to be set into messy thin set mortar. All you need is silicone below the pan to keep it in place (note – if your floor isn’t reasonably level you will need thin set or leveling mix). As athletes like Bruce Jenner, Mary Lou Retton, Pete Rose and Michael Jordan would tell us, if you’re installing a solid surface shower pan you better eat your Wheaties (or make a nice steak dinner for a friend who is helping you out!). If you don’t figure out the weight up front you may have to design some crazy – yet ingenious -contraption (modeled after Egyptian pyramid builders) like one of our customers below. He ordered a mammoth custom solid surface shower pan (note – I should have talked to him about the weight of this base -oops – my bad). Check out this video. 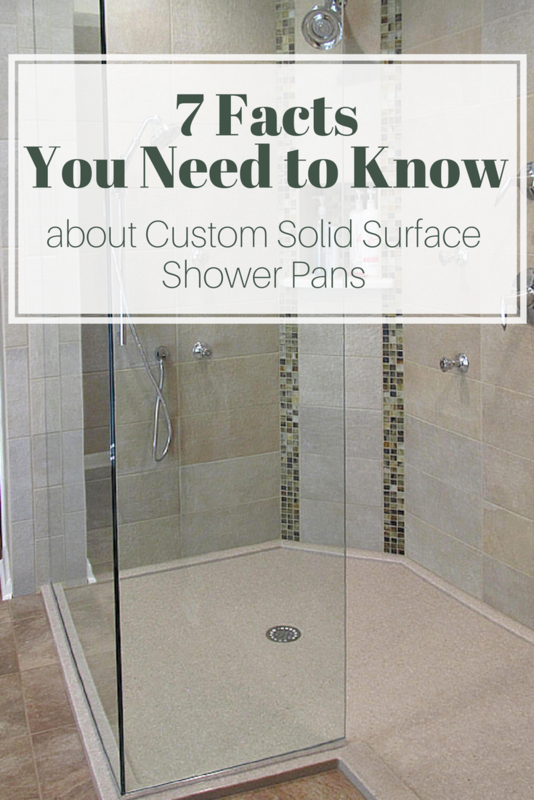 After reading these 7 facts do you think a solid surface shower pan is right for your job? The positives of this base are it’s solid, durable as a tank, customizable in every way and won’t flex or bend when you walk on it. The negatives are it’s not a ‘cheap date’ and installing it is likely a 2-person job because they are heavy. Does this type of base make sense for you? I’d love to hear your questions and comments below. Can I (or my team) help you with technical questions or pricing a custom solid surface shower pan or wall surround kit? My goal was to give you the most important facts about these pans– but I certainly haven’t covered everything you might to know about your job. If you have a project (anywhere in the country) call me – or a member of my team – we’d love to help you spec it out or quote it. Call Innovate Building Solutions at 877-668-5888. For a Cleveland bathroom remodeling job call The Bath Doctor in Cleveland at 216-531-6085 or in Columbus at 614-252-7294. I am looking to purchase a one piece shower pan, 48″ x 80″ center drain. I am located in Sacramento, CA. 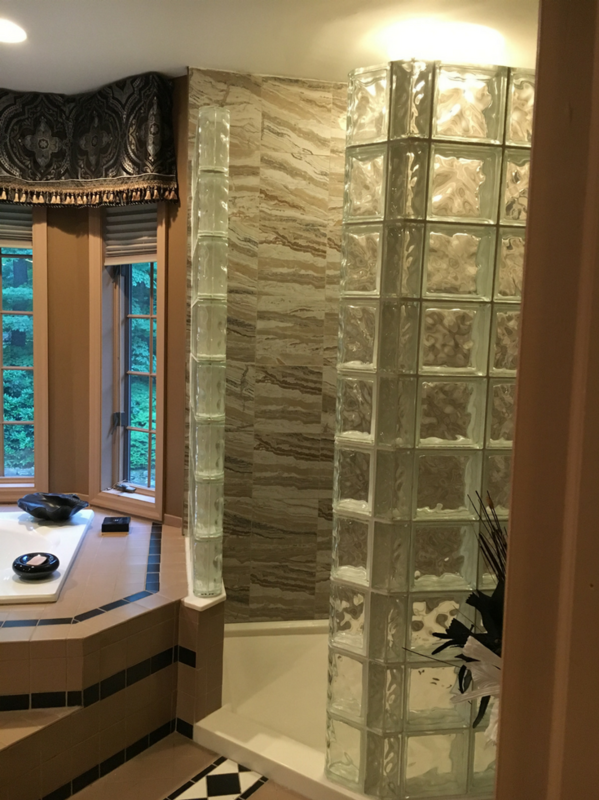 I have had the pleasure of working with Mr. Foti (whom I did not originally know was the President of the company) with the planning of my bathroom remodel. I was interested in the solid surface wall surrounds, custom pan, corner caddies, foot rest, etc. He was extremely helpful with all aspects of the decision process including videos, instruction sheets, design ideas, colors, etc. He was very responsive to email questions and telephone calls. I would highly recommended his company and products. We are very happy with them and our new bathroom.